Cauliflower is such a versatile vegetable. Regular readers of this blog will know all the things that I do to cauliflower. I rice it and mash it and in some cases break it down into very little pieces. Often I will steam it. I was once in my doctor’s office and as she works in a teaching hospital, she had a med student shadowing her. After giving me an exam, she sicked him on me to give me the speech about losing weight. He started on this story about when he gets together with his family they all cook such good food. But little changes in the dishes can really go a long way. 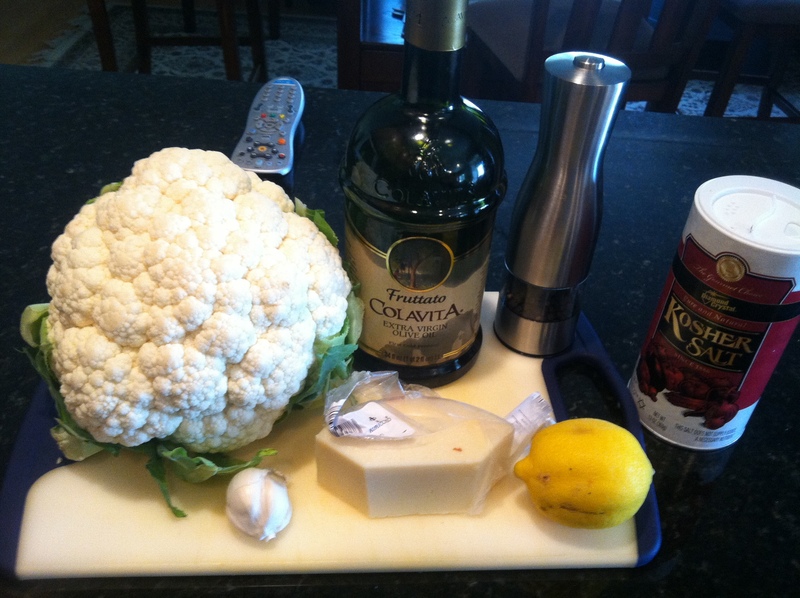 For instance, with the cauliflower, his family used to pour cheese over it. He continued that just by skipping the cheese, and other minor substitutions, someone could go a long way to eating healthier. All I could think was – I never have cheese with my cauliflower. Why don’t I? I just have it steamed. Cheese really sounds like it would be great on it. Maybe I should put cheese on it the next time I make it. I don’t think this was his intent, but he gave me a great idea to eat less healthy. This, unfortunately is not that recipe, but a great one never the less. Roasting any vegetable brings out great flavor. OK. There is some cheese here, but it is not poured on top. Break it apart and coat with spices, olive oil and a little lemon juice before it goes in the oven. Cauliflower is probably my favourite vegetable (much better than broccoli to my taste) and I like it steamed. But this sounds like a winner; I’ll definitely be trying it. My second favourite vegetable after Brussel’s Sprouts! I use it in so many different ways – including piccalilli! Yes, delicious raw too. Look forward to the harvest pictures. When I’m dry-brining veg for piccalilli I always find myself snacking on the raw cauliflower! The piccalilli recipe I use doesn’t call for cooked vegetables – they have to be raw and crunchy! PS … and I love cauliflower cheese – lots of butter and strong, mature Cheddar cheese. Absolutely 100% healthy! Brussels sprouts and beets are so transformed when roasted that people who think they like neither change their minds. Ohhhh, that looks so good!!! I really have to try this :). Cheese is good! It makes other things better. 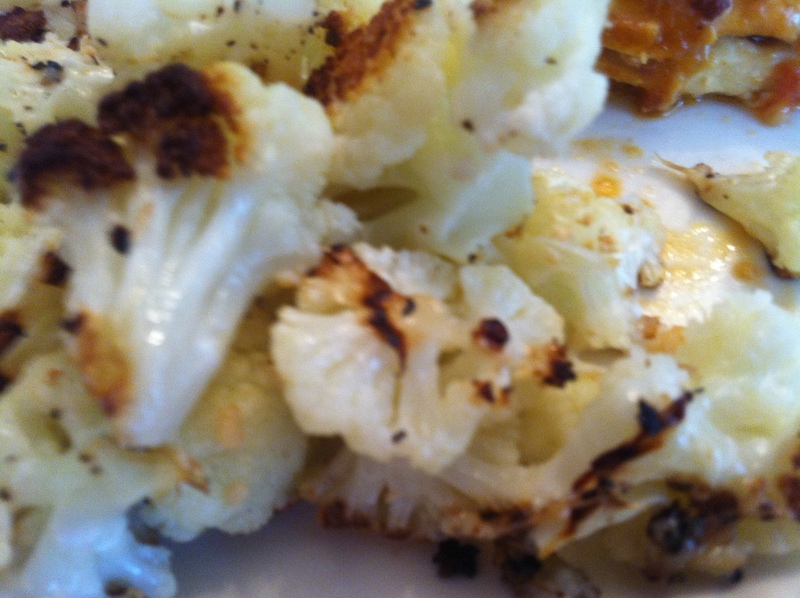 I grew up on cauliflower steamed, but now I love it roasted. 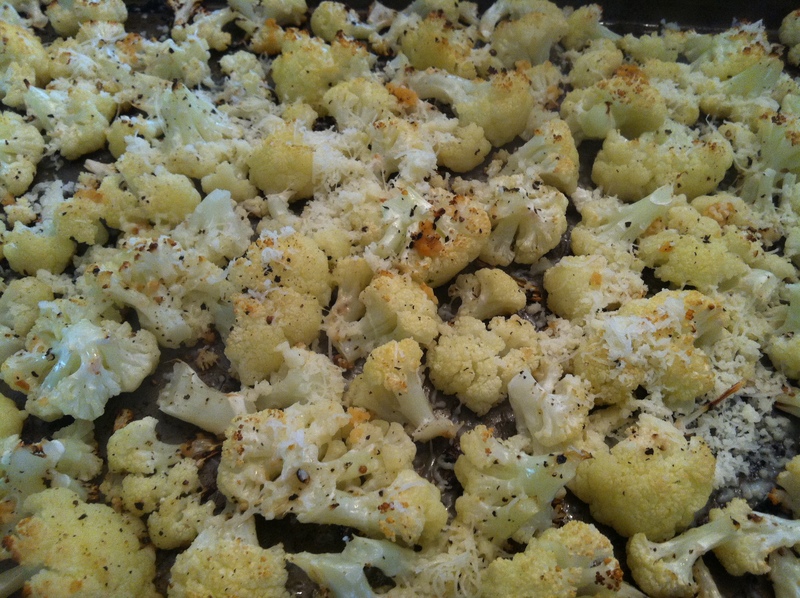 Check out my recipe for cauliflower au gratin. I wish I could say I liked your blog, but sadly I have to say I absolutely LOVED your blog. Both Mark and I found it very humorous. Oh and I like the recipe also. Thanks for the giggle. ja, a few slices of parmeasan ala garnish … et voila 😉 nice touch man. Cauliflower cheese is fantastic. Cheese always makes things better. We steam cauliflower and broccoli all the time. So good! Cheese would definitely an awesome addition! I suggest putting cheese on top of béchamel, on top of cauliflower. It’s great roasted with Indian curry spices too, but Dr. Dan’s suggestion is also delicious. 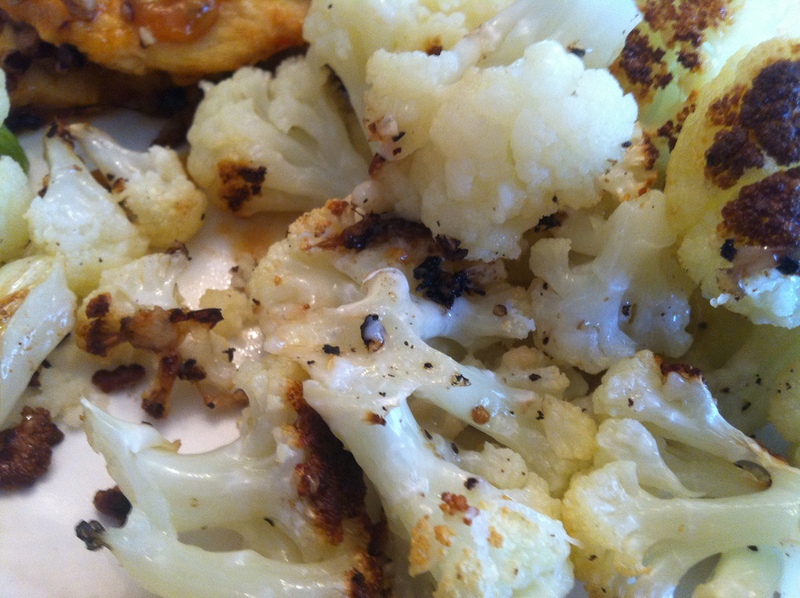 Cauliflower gratin is the dish that got me to like this vegetable. Doctors receive one 3 credit hour course on basic nutrition during their medical training. All due respect, they are not nutrition experts. All foods fit, even cheese. yay cauliflower! This sounds yummy! 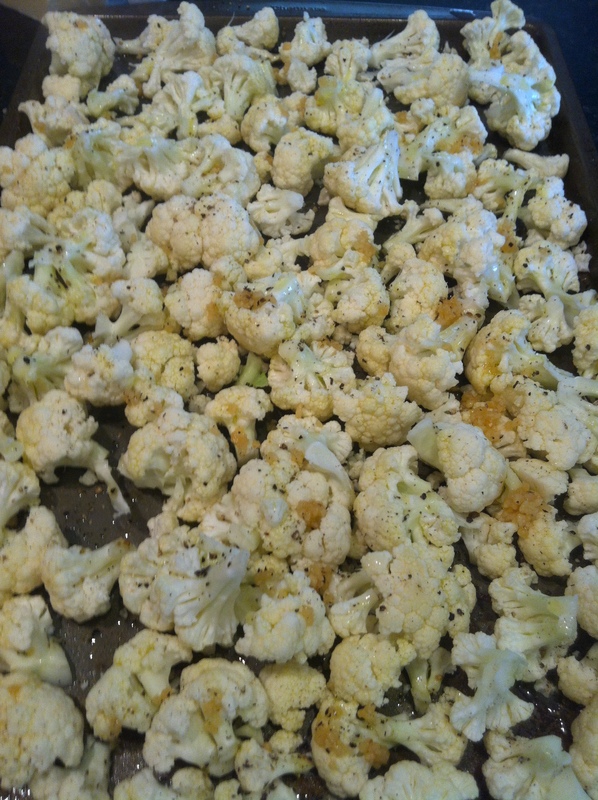 To date my favorite is to just butter / lightly mash cauliflower with a little bit of curry powder. This recipe sounds delicious! Cauliflower needs something to liven it up, which is who I don’t like the mashed version- too bland. That being said, there’s nothing wrong with cheese sauce except the flour or cornstarch invariably used to thicken and smooth it. I like grated, smoked cheddar on top myself :). I love cauliflower. I often mash it with a little goat cheese. I don’t miss potatoes one little bit. A great low GI vegetable. This makes me smile. I’ll confess, I have to force myself to think, “Maybe I SHOULDN’T put cheese on it.” I love cheese more than chocolate. I really enjoy your blog. I look forward to visiting often.